The Woman’s Home Companion often featured “Triad” patterns, which promised three styles from one Butterick pattern. This one, Companion-Butterick 7361, is unusual in that the styles are so very different from each other. The flattering center-pleat skirt is shown with and without top stitching, in crisp or soft fabric, but it’s recognizably the same pattern piece. The bodices, however, have very little in common. Left, Companion-Butterick 7361 in a sleeveless version with tied shoulders and a sharply angled front. The armhole seems to echo the pointed front. Bows at the shoulders are repeated in the belt. There is a small, angled bust dart at the side, but most of the bust fullness is supplied by fabric gathered at the shoulders. The “sunback” opening is square. 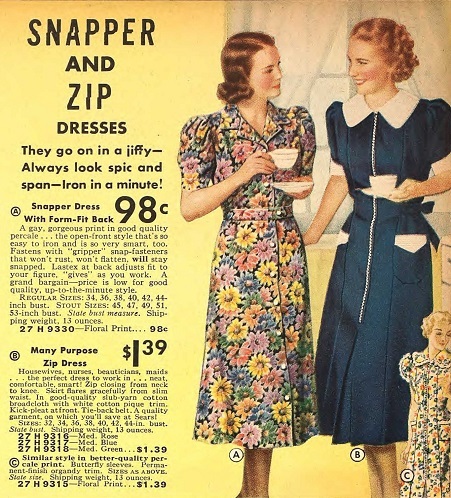 In 1937, zippers on relatively dressy dresses were a new idea. 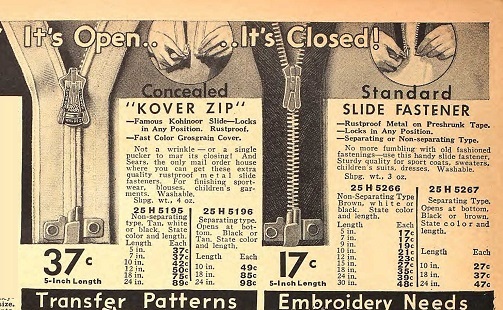 (And zippers were not always available in a wide range of colors.) This dress is not active sportswear, nor is it a housedress or work uniform. The small white clutch purse hints that this could be worn shopping, or out to lunch. In this version of Butterick 7361, the bust fullness is controlled by two parallel tucks at each shoulder. Tiny (false?) pockets with tabs have white buttons to match the buttons on the puffy sleeves. The third version of this dress is definitely the most formal. A formal afternoon dress version of 7361 is illustrated with a sheer over-layer, which could have long sleeves. WHC, May 1937. In this version, the bodice has a shaped waist with the fullness softly gathered to it. The shoulder area is shirred. The modestly V-necked collar is trimmed with artificial flowers, and the belt has become a sheer sash tied in a big bow. Text explaining Companion-Butterick 7361, Womans’ Home Companion, May 1937, p. 83. Sometimes WHC illustrators drew shoes supplied by their advertisers, but I can’t find an exact match from this issue. Air Step shoes ad, with prices, WHC, May 1937. The high heeled sandal on the right is very similar to the black shoes shown with the afternoon dress version of 7361. From an ad for “Cabana” shoes by Walk-Over, WHC, May 1937. Cabana shoes from Walk-Over, from an ad in WHC, May 1937. Perforated shoes for summer. The “Ardwyn” style was patented. I tend to think of white, perforated shoes as “old lady” shoes, probably because my grandmother still wore them in the 1950’s. But the two-tone “Caribee,” above right, right does not have wide, low, “old lady” heels. A store-bought, zip-front, print dress similar to Butterick 7361 is worn with stack-heeled white shoes by the model in this ad for Air Step shoes. WHC, May 1937. For casual shoes, Keds (United States Rubber Co.) made many attractive cloth shoes in the 1930’s. Ad for Kedettes cloth shoes for summer; WHC, May 1937. They were available in a wide variety of colors and styles. Prices $1.29 to $2.29. I love those striped soles!